The Water or Indian Buffalo originated in South-east Asia. A large animal, it can stand up to 180 centimetres at the shoulder and weigh 900 kilograms, with wide-spreading horns. Water Buffaloes have been domesticated for many centuries, principally as draught animals, although some groups have reverted to a feral state outside their country of origin – including Australia. 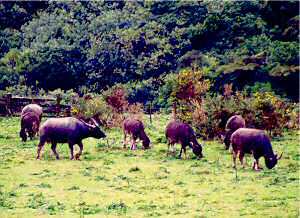 Water Buffaloes have been imported into New Zealand from Wildlife Parks to establish breeding herds farmed for meat.